Last week after earthquake in Christchurch it was a lot of traffic coming to website with question – is it safe to travel there? You should use your common sense. If you saw latest pictures from Christchurch the city is damaged badly, from many homes people are evacuated because of concerns over cracks in the rockface above homes. As many as 500 downtown buildings may be demolished, but rebuilding will not start till aftershocks stop. It doesn’t sound like safe place for walkabout. Why should you risk to go there? Check pictures on internet instead if you are interested to see how city looks right now. This website has interesting before and after pictures. Above picture is taken from this website. If you need up today information about situation ad emergency number, visit this website, there you’ll find a lot of useful links. The central city of Christchurch remains cordoned off and between the four Avenues (Bealey, Fitzgerald, Moorhouse and Rolleston). Only emergency workers and residents authorised to access their homes within the cordon. Today it was another earthquake in Christchurch, so check for latest information, as info in this page can be outdated. I agree it is probably safe to visit New Zealand if you skip Christchurch for the time being. Nature is something we just don’t have any control of and it is certainly letting us know that, all over the world at the present time. I’m more inclined not to travel if there is civil unrest or terrorist threats happening in foreign places. But I feel New Zealand and Australia are relatively safe countries to travel in. What do others think? 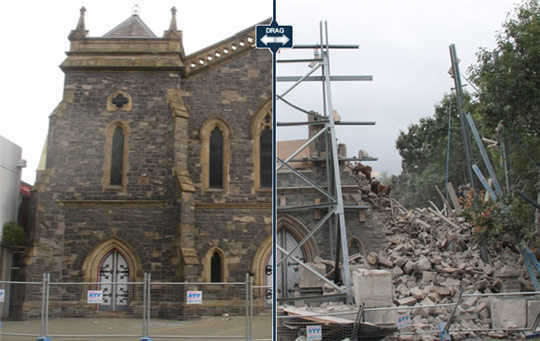 If we skipped Christchurch, that would means a ‘regret’ or please let us know which area of Christchurch should not be missed.